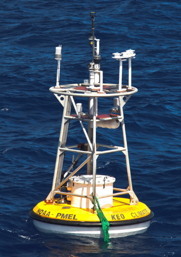 NOAA’s Ocean Climate Stations Project (OCS) maintains reference station moorings. These moorings have meteorological instruments on the surface buoy to measure winds, air temperature, relative humidity, barometric pressure, rainfall, downward infrared radiation from the sky, incident light (heat) from the sun, as well as sea surface temperature and salinity. Sensors attached to the mooring line measure upper ocean temperature, salinity, and near surface ocean currents. A sensor mounted on the anchor release measures bottom water temperature, salinity and pressure. The moorings also carry sensors from partner groups to measure atmospheric and seawater carbon dioxide, dissolved oxygen, and pH. 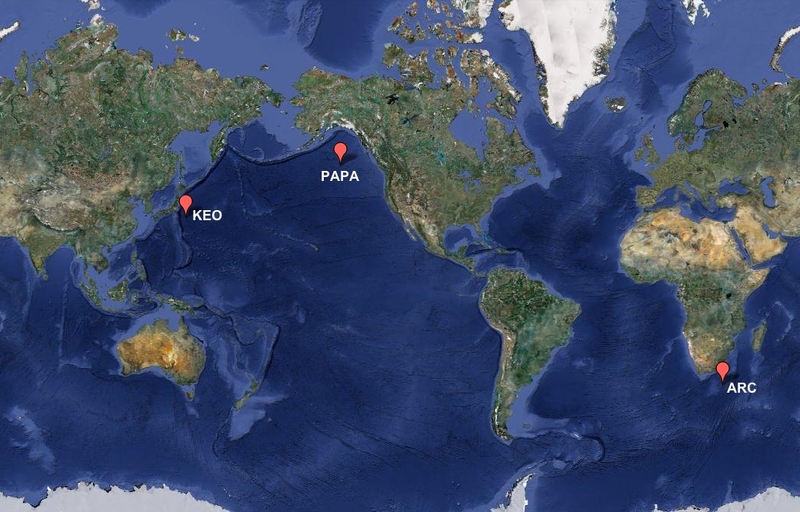 OCS moorings are part of the Ocean Sustained Interdisciplinary Time series Environmental Observatory (OceanSITES) global network of ocean reference stations. Data from OCS moorings provide the foundation blocks for NOAA’s Climate Observation Division’s program deliverables of global climate analysis products. These measurements can be used to help improve weather and storm forecasts, inform climate projections, and verify satellite products and models.